The Three Rs: Rants, Raves and (Occasional) Reflections: She's 50? She Doesn't Look a Day Over 40! An important resident of my hometown had a birthday yesterday. The Gateway Arch is now 50 years old! She looks great for 50--polished, slim, a lady who commands attention--and to my knowledge, she's never had a facelift. 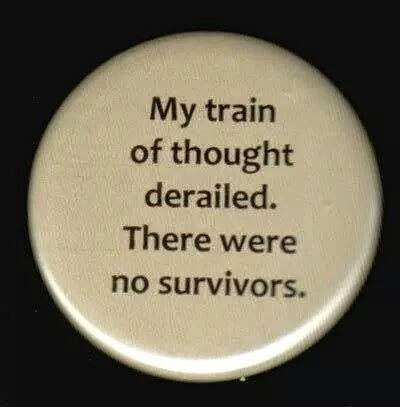 At least not until now. There's some major work going on at the Jefferson National Expansion Memorial, not expected to be completed until 2017. The place is a mess, actually, hardly a suitable place to celebrate the great lady's golden anniversary. But celebrate we did. I'm just sorry Collin had to work yesterday, making us miss out on those Arch cupcakes! Like most grande dames, the Gateway Arch has a bit of a checkered past. Her story starts decades before the final piece was inserted into her magnificent form on the morning of October 28, 1965. It starts in 1933, with then-Mayor Bernard Dickmann, a New Deal Democrat, and Republican lawyer Luther Ely Smith. The country, St. Louis included, was emerging from the Great Depression. When city leaders were planning their pitch for some federal money, Smith pushed Dickmann to dedicate a potential riverfront project to Thomas Jefferson, to give the proposal a national element. It worked, and the Jefferson National Expansion Memorial, then known as Jenny Mae, was born. But there was a catch.There's always a catch, especially when government money is involved. President Franklin D. Roosevelt would approve the funding requested--but only if city residents approved a $7.5 million bond issue. On September 10, 1935, it was approved with a 71% yes vote in an unusually high voter turnout. It seemed a miracle had taken place in St. Louis, and a large number of the dead had risen from their graves to vote for it! In spite of protests from New Deal critics, FDR awarded the project $6.7 million from his Public Works Administration. Thirty-seven city blocks were demolished with little regard for history--only the Old Courthouse and the Old Cathedral escaped demolition. The project came to a screeching halt on December 7, 1941, when Japan attacked Pearl Harbor and the US officially entered World War II. It didn't resume until the final months of the war, when the Jefferson National Expansion Memorial Association announced a design competition. They were looking for something bold and dramatic, not "just another statue." Among the entrants were were Eliel Saarinen, a Detroit architect, and his lesser known son, Eero. Eero Saarinen proposed a towering arch. It was chosen by a unanimous vote, but when the design was announced, not everyone was thrilled by it. There were jokes, most notably one about a giant croquet wicket. President Harry S. Truman dedicated the site in June 1950--and two weeks later, the Korean War began. Once again, the riverfront project was on hold. After numerous setbacks and budget issues, the excavation for the Arch got underway in 1961. When it was finally completed in 1963, Eero Saarinen wasn't there to see his design become a reality. He'd passed away in 1961. The Arch itself had a final price tag of $11.4 million, $56 million for the whole park. 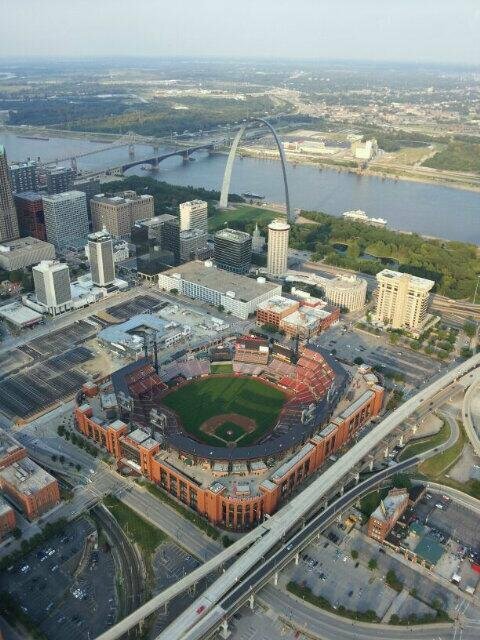 It wasn't a bad price to pay for a landmark now recognized around the world--and to secure St. Louis as the Gateway to the West. Good for St. Louis ! Sometimes it works out. Remember all the work they did to the derelict waterfront area that was in London. It was cleaned up and used for the Olympics. A friend just went back and it is as beautiful and more fun for everyone. Everything thing is better than before. Well worth the money! 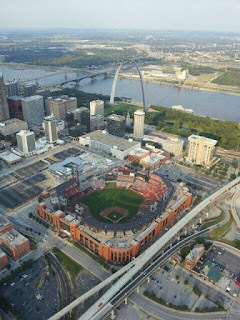 I think everyone knows about the Arch in St. Louis! Quite a lot of history. It is such a beautiful monument. Very cool. What's an arch cupcake? Gayle: I do remember! Like London, the St. Louis riverfront was in a state of urban decay until the Arch project began. Cheryl: Our Arch is as recognizable as Lady Liberty in New York, the Eiffel Tower in Paris, or the Opera House in Sydney, I think. That was the objective--for anyone who saw it to identify it as St. Louis. William: She's even more impressive in person! You have to visit one day! I took a friend to the observation deck during a thunderstorm--it's perfectly safe. I once took my agent up as well. She enjoyed the ride to the top as much as the view from the observation deck. 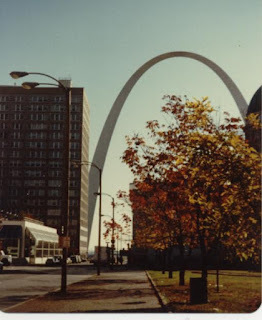 Mari: I don't do history very often, but the history of the Arch is one I found intriguing. There's more, but the post would have been too long! Ivy: They're cupcakes appropriately decorated with symbols of the Arch and her history. I went up inside it a long time ago. Good history, Norma. Very interesting stuff I didn't know. Excellent pictures too. Interesting history. It is remarkable how many dead people get up and vote. Happy Birthday Gateway Arch! Grace: I'm quite familiar with Bob's Arch photos. His wife Carolyn is one of my dearest friends! Lorelei: I took the first photo some years ago. The second was taken by the captain of the Despicablimp when it came through St. Louis promoting Despicable Me 2. I have several photos, more recent ones, but I can't find my files! Lynn: I'm surprised they got away with it!